When I go on a trip, I like to look back over my images when I get back and see what the first image I took was: the first thing that inspired me to pull out my camera and commemorate it. 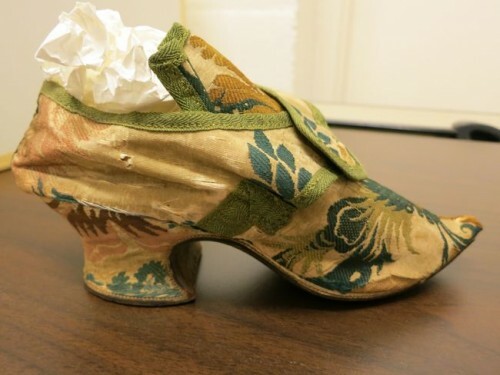 It’s an 18th century shoe in the textile store at the Honolulu Museum of Art. I love this. It’s so typically me: the first thing I wanted to do on Oahu was go to the HMA, and the first thing I immortalised was a 250 year old shoe – not the usual Hawai’i image at all! I’m lucky enough to know the director of the Honolulu Museum of Art (formerly the Honolulu Academy of Art), and he really wanted me to meet the textile curator and tour the textile store. Was I interested? Are you kidding! Of course! I thought the HMA textile collection would be very Hawai’i focused – all Hawaiian quilts, vintage holoku, kapa (barkcloth) and woven lauhala mats, with perhaps a big dollop of Asian textiles, thanks to Hawai’is links to Asia. 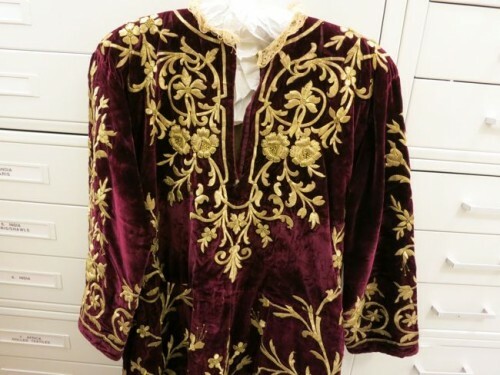 This was a huge oversight on my part – every other museum store I’ve ever seen (in the dozens) has had the most random collection of fashions and textiles from every time-period and every part of the world. It’s the byproduct of decades of collecting: of donors who give huge lots of their grandmothers lace and the stuff their great-uncle picked up when he was in the merchant marines; and the result of how difficult it is to deaccession stuff that doesn’t fit the collection. Of course the HMA textile collection would have bits of anything and everything. Not only does the HMA textile collection would have bits of anything and everything, it should have bits of anything and everything. Hawai’i is the crossroads of the Pacific – anyone and everyone has passed through. 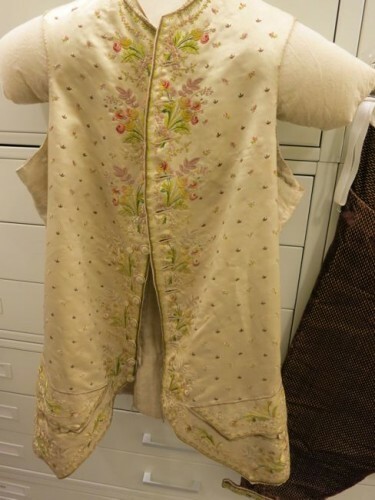 So in addition to the bits I expected, the Hawai’ian clothes and textiles, the gorgeous Chinese and Japanese robes and kimono, there are also shelves and drawers of Indonesian textiles, and (the stuff you are interested in) utterly stunning 18th, 19th & 20th century fashions. I had the most glorious hour in the textile store with the lovely curator, drooling over the Chinese textiles that will be included in their upcoming textile exhibition ‘Birds, Bats and Butterflies’ (I hope I have the order correct), sighing over the Hawaiian quilts, squeeing when I found the 18th century shoe, and swooning over the 18th and 19th century textiles. It was simply fabulous, and a wonderful reminder of how many amazing textiles are out there: in addition to all the collections we know and love such as the Met and the V&A and the LACMA, all sorts of other museums will have their own treasures, and many museums will let you make appointments to see and study them. The whole outfit was recently featured in an exhibition on men in lace. Delicious! 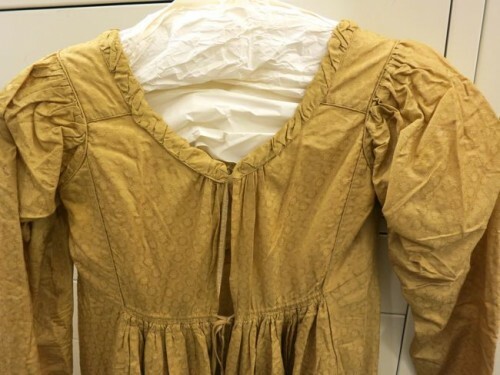 And finally, the most darling, exquisite 1810s frock in sure-to-make-the-Dreamstress-swoon golden-yellow silk. I’ll post more about each individual garment in the coming weeks. (Especially the shoes, as I thought of Her Grace and took LOTS of photographs of every detail of them!). How wonderful for the museum to have that whole French outfit! Jacket, pants and waistcoat! Any one piece would be a treasure – the whole outfit is very special. And the yellow silk dress – much looking forward to seeing more of that. It all sounds wonderful – thank you for the tastes. I love the 1810 golden-yellow silk frock. How lucky you were to get to see such a wonderful collection. 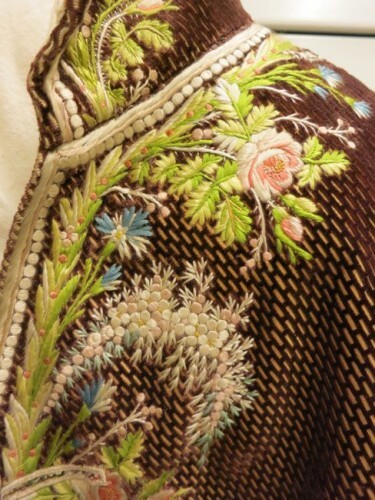 Such beautiful embroidery on the other garments too. Well worth the trip. Man, people have the coolest stuff sometimes. I’m glad that a few of the people with that coolest stuff donate it to museums and everyone can enjoy it. That man’s suit is awsome! The embroidery on those is just unbelievable, isn’t it? It’s cool that you can go in and look at all of these awsome antiques. I would love to be let loose in the Met storage areas–I’d probably stay there a few years! 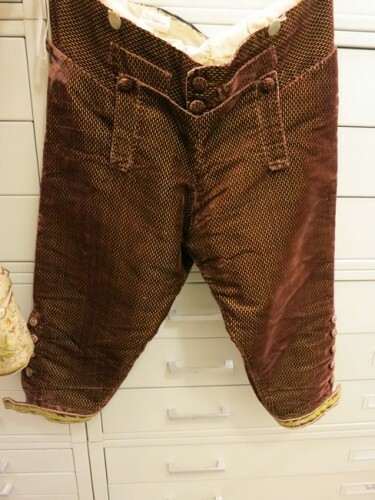 That’s an interesting printed velvet used in the embroidered breeches suit; I’ve never seen a similar specimen. Very interesting! Thanks for posting this. That embroidered mens suit is amazing. And the shoes! I can’t stop staring at the perfect little hand stitches, they’re so even they almost look machine sewn. It’s awesome that the museum let you make an appointment. Oh wow. Thanks so much for taking these photos for us! Will do! I got lots of close-up shots of the embroidery, because it was a much easier space to do that in. I don’t think the suit arrived in Hawaii in the 1890s – more likely it came with a missionary family, or other American immigrants, in the 19th or early 20th century.